1- APR=Annual Percentage Rate. The promotional APR for balance transfers and purchases for new cardholders is 0% for the first 12 billing cycles after card issuance. The balance transfer fee is 3% or $10, whichever is greater, for Terps VISA® Signature Rewards accounts. After that, your APR will be 14.25% - 24.00% based on your creditworthiness. This APR will vary with the market based on the Prime Rate. 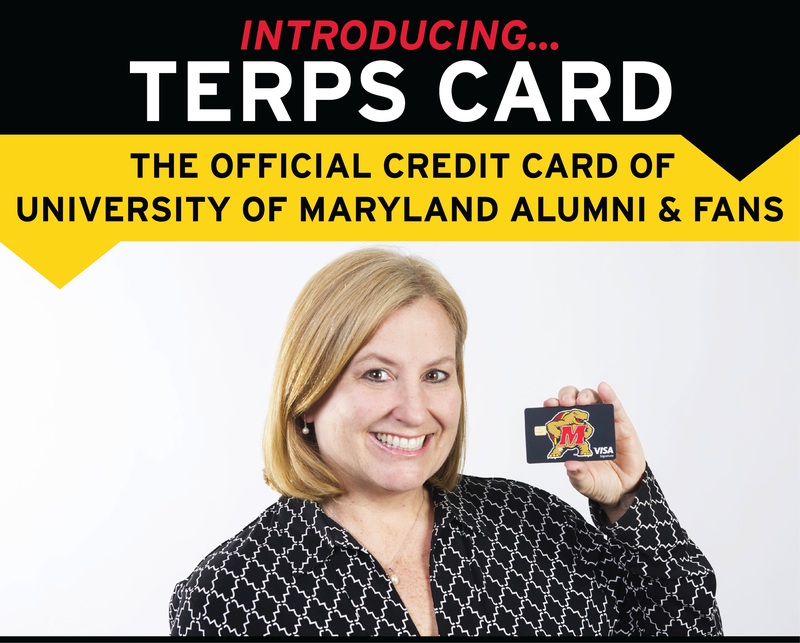 If you are requesting Terps Card to transfer outstanding credit card balances to your Terps VISA® Signature Rewards credit line, finance charges will accrue from the transaction date with no grace period. Allow at least two weeks for processing your request(s). Continue to make monthly payments to each creditor until the balance transfer appears as a credit on that account. 2 -Ten times bonus points apply to applicable purchases from the University of Maryland. Allow 30 days for points to be applied. Offer available for a limited time and subject to end without notice. 3- New cardholders are eligible for 50,000 bonus points after $5,000 in purchases within the first 90 days of card issuance. Allow up to 60 days after promotional period for points to be applied. “Purchases” do not include balance transfers, cash advances, travelers checks, foreign currency, money orders, wire transfers or similar cash-like transactions, lottery tickets, casino gaming chips, race track wagers or similar betting transactions, any checks that access your account, interest, unauthorized or fraudulent charges, and fees of any kind, including an annual fee, if applicable. To be eligible for this bonus offer, account must be open and not in default at the time of fulfillment. Transactions are subject to the account opening disclosure and your Credit Card Agreement. Terps Card reserves the right to refuse any application.